Have you ever felt yourself totally stymied by an angry fighting couple? That happens to just about every therapist, because change isn’t simple. Propelling reliable change takes working with a very specific set of principles and a very targeted set of skills. And, you need to be a strong leader, who sets firm boundaries, and addresses underlying deficits without letting either partner bully you into discussing the fight of the week. That’s a tall order! Who would want to work with the type of couple that challenges you so much and so often? Don’t be afraid to acknowledge that these types of couples stretch you. I remember getting emotionally flooded by many difficult hostile fighting couples. I remember not being strong enough to control sessions with them. But I will say that once you have the right tools and skills and the intensity of these couples no longer intimidates you, it is very satisfying to work with them. You might even find that you look forward to your appointments with them! They are competitive and escalate hostility either overtly or passive aggressively. They have a high level of sensitivity to confrontation, so if you confront them unskillfully they will often attack you or collapse into a very deep victim position. They ignore your interventions and keep on fighting. It’s almost as if you’re not in the room. They continually retrigger trauma in each other. They don’t know how to repair relationship ruptures. Instead they just shut down, lick their own wounds, wait for time to pass, and finally begin to talk to each other again. Sadly, that leaves them primed to easily retrigger the same pain again. One partner demands intimacy. They will want it, they’ll insist on it, they’ll yell for it, but they don’t have the emotional capacity to support the intimacy they crave. They fear and avoid vulnerability. Identifying these patterns and getting comfortable witnessing so much aggression will help you know which tools to use. But in order to be really effective in creating long term change with these couples, you need to understand why they are the way you are, and why working with them is uniquely frustrating. Hint: it has to do with entrenched belief systems. 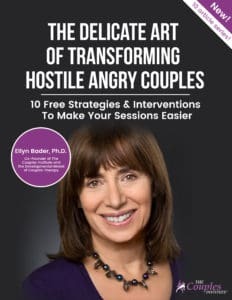 In a few days, I’m going to share 6 of the most common, frustrating beliefs that are underneath hostile angry couples’ competitive fights that go nowhere. One of the things that the participants love in my Developmental Model online training program is our deep dive into the psyche of hostile fighting partners. Understanding why they are the way they are and what’s underneath the recurring problems is instrumental in helping them get traction – and leads to added confidence in their sessions. Most of my students start off expressing how tough it is working with these couples. They enjoy having a community of people who truly understand what they’re going through. But what’s really great is a few months into the program, they’re sharing success stories of how their couples prevented a fight or reliably followed through on their homework. It’s rewarding to witness how excited and proud they feel after these breakthroughs. There are dozens of therapist trainings out there, but I've made it my #1 priority to make the Developmental Model program 100% fluff-free. To maintain that high standard, I don't let anyone join at any time. I've created a waiting list so when you join, you have the best experience possible. Click here to join the waiting list and be notified when we open in January. SO True!! Hostile couples are the most challenging for me . I have experienced the feeling that I am not in the room. Or the couple might take my intervention for 10 seconds-saying “that’s true or valid” and then turn to their partner and say the very same dysfunctional statement! #1. I hadn’t thought of before -about how they are competitive with another. Also #6 with the demand of intimacy.